Have you noticed how respectable diners serve Challah French Toast?! Chefs are outdoing each other in their recipes for Challah French Toast! Guess what? They are missing the main ingredient: authentic Challah! The texture of the Challah changes based on its size and ingredients. 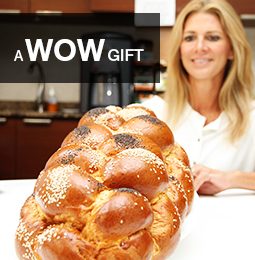 We pride ourselves in the taste of our WOW Brooklyn ChallahTM. The Challah French Toast experience has now been redefined! Now that you’ve come to the authentic source of Brooklyn ChallahTM, you won’t be surprised to learn that we’ve collected some great recipes for Challah French Toast. We love the recipe of Ina Garten, the Emmy Award winning host of the Food Network program Barefoot Contessa. Click here for Ina’s recipe. The recipe has gotten some outstanding reviews, like this one: “I just watched Barefoot Contessa and she made a romantic breakfast for dinner for her husband”. Looking to go Gourmet? Here are a some exciting possibilities: Challah French Toast with Strawberries Recipe, or Challah French Toast with Berry Sauce. Hey, if you have a recipe that you would like to share, go ahead and send it in!